Phu Quy Island is one of the very interesting place for exploring because it is the without the effect from the smokeless industry at the moment. Phu Quy Island is considered the rough gem of Binh Thuan province. It is the paradise for backpackers and the new world to the tourists who love to discover the new things. 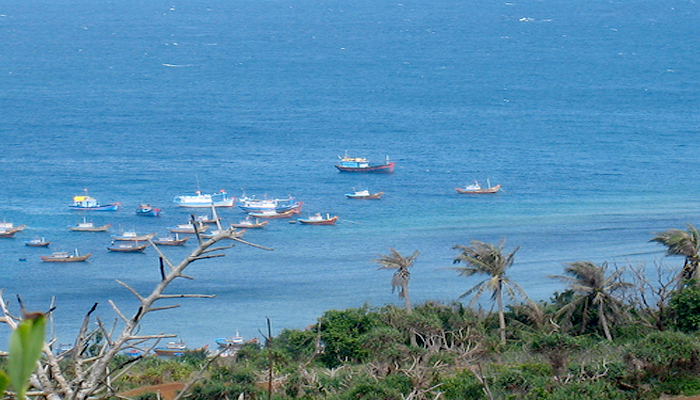 Phu Quy Island is located far from Phan Thiet City more than 100 km. It belongs to Phu Quy District. It takes you more than 3 hours for transfer by boat. There are many small islands around Phu Quy Island to create the system of islands with their rich nature and landscapes. They are the wonderful world to people to explore. Commune: There are 3 communes in the island. They are Long Hai, Ngu Phung and Tam Thanh. And Ngu Phung Commune is the center of the island. Climate: Phu Quy Island is in the region of marine climate, tropical monsoon and Asia Equator. The average temperature is 27 C degree. The best time for travelling in the island is from January to May. Transportation: Travel conveniently by boat to the island and from it to other places. Bai Nho: or Nho Beach ( Small Beach). This is one of the best beaches in Phu Quy Island. It takes you about 10 minutes by motorbike from the island’s center. People call that Bai Nho is the small paradise with the great picture of the nature within the blue sea, the blue sky and the white sand beach in its interesting calm. Trieu Duong Bay: this is the small bay in the island with white sand beach and pine forest in the bank. It takes you just more than 5 minutes from the island’s center to the bay. .
Hon Tranh: the place is not far from the port in the island. It takes you about 10 minutes by canoe. Visit here you have chance to experience the normal life of the habitants here with their main work is lobster fishing. Van An Thanh Temple: Van An Thanh is the important temple in the island. In this there is the huge whale skeletons are kept. Van An Thanh Temple is considered the very old temple with its a thousand year old. Cam Mountain: the mountain is located far from the port of the island about 3 km. There is the old large lighthouse. This is one of the wonderful places to see the sunset in the island. Linh Son Pagoda: this is the pagoda located in Cao Cat Mountain. It is far from Cam Mountain about 4 km. Linh Son Pagoda is the value place for the spiritual life of the island’s habitants. Fish Festival: this is the most important festival in the island. The festival is happened in March in the lunar time. It is organized in Van An Thanh Temple with many activities. Phu Quy Island is same with other island and the beach city in Vietnam. The specialties in the island are fresh seafood with the good local cooking way. The best seafood here is consisting of lobsters, squids, king crabs, cone snails and holothurians (sea cucumber).